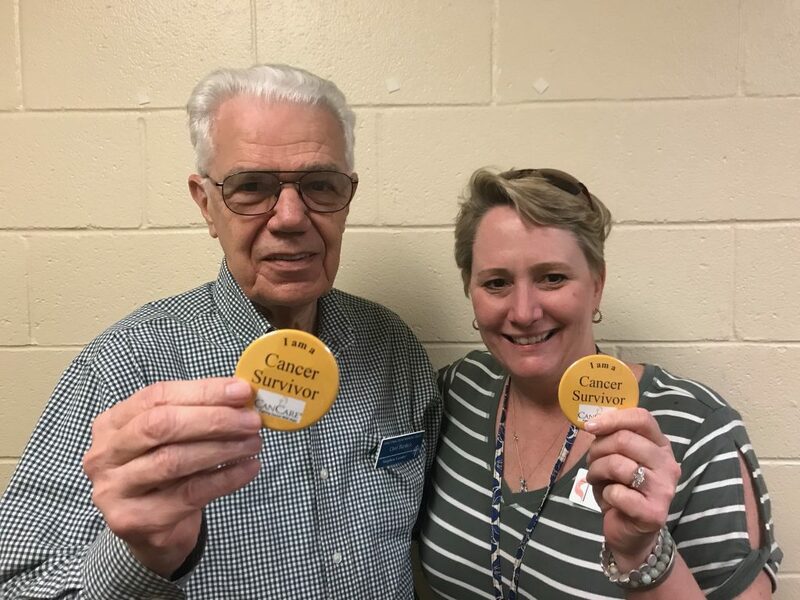 Volunteers Chet Burdick, Kristi Forbes, and I wear this button as we visit with cancer patients currently undergoing treatment at a local radiation center and hospital. As three of the 600+ trained volunteers nationwide (almost 100 in the Atlanta area), we are part of CanCare, a non-profit organization based in Houston that provides emotional support to cancer patients and their families. As we make these visits, we strive to embody the message of hope to those currently facing this scary and ugly disease. Let me tell you more about this organization and its mission, as well as how we became involved and what we do. What is CanCare? What is its purpose and how does it work? Founded by a colon cancer survivor in 1990 in Houston, Texas, CanCare’s goal is to be there to support anyone impacted directly or indirectly by cancer. Their website (https://cancare.org/) describes this organization as a “mighty community of survivors who lift up and inspire cancer patients and caregivers through one-on-one support, empathy, and hope.” Acknowledging that cancer is hard, CanCare volunteers serve to help alleviate the loneliness that so many patients and caregivers feel during this journey. One-on-One Emotional Support. Cancer patients and caregivers are matched with a volunteer who has survived the same or similar type of cancer to receive one-on-one positive encouragement and Hope from someone who understands firsthand what they are going through. Hospital and Treatment Center Visits. Volunteers regularly visit cancer patients in area hospitals and treatment centers to provide immediate, in-person services to patients and their caregivers currently undergoing medical treatment. What about CanCare in Johns Creek? How did we get involved and why do we do this? Chet, Kristi, and I celebrate our survivorship by volunteering with CanCare. Like many of you, cancer has impacted our lives and we want to provide hope and encourage to those currently facing this disease. After undergoing training through the Atlanta Chapter of CanCare, we immediately signed up to volunteer – either at the Northside Radiation Center or Emory Johns Creek Hospital. As a 27-year colon cancer survivor, I was initially a reluctant recruit to this ministry. Although my cancer seemed like it was ages ago, in my mind, it seemed like only yesterday. I asked myself, “Why would I want to volunteer for an organization that would be a constant reminder of my cancer?” Finally, I felt a tug on my heart suggesting that my experience and fears would help me empathize with those going through similar experiences and emotions. I realized that I might be able to give others hope that they too could be a long-term survivor of this awful disease. What do we do as CanCare volunteers? Although Chet, Kristi, and I have experience with one-on-one support with cancer patients sharing a similar cancer experience, we spend most of our volunteer time visiting patients and their families at the Northside Radiation Center and Emory Johns Creek Hospital. I visit cancer patients at Emory Johns Creek Hospital – both patients receiving treatment in the Infusion Center and patients who have been admitted into the hospital for treatment or care. I’ve been visiting patients twice a month for about 4 ½ years and it has been a real blessing to me. When I walk up to a patient, I generally don’t know what to expect. Their types of cancer and treatments vary. Some have caregivers with them; others do not. Some want to share their cancer story with me, sometimes in great detail. Others seem to enjoy conversations about anything but cancer. I often find that patients who have been admitted into the hospital are lonely, probably scared, and tend to appreciate our conversations. Those visits tend to be longer. One-on-one matches are great for those patients and caregivers who are struggling and want the support of an “outsider” who has gone through a similar cancer experience. It allows folks to share their struggles and concerns without feeling they are overburdening their loved ones. Support is available over the phone, via text, email, and in person – one time or on an ongoing basis. I have had several matches over the past five years. Although all of my relationships were brief, I felt like I provided a real-life example of someone who’s walked in their shoes and come out the other side, and hopefully, provided a bit of comfort to them. Are you currently undergoing cancer treatment? Are you caring for a loved one undergoing treatment? If so, would you like one-on-one support from a CanCare volunteer? Would you like to provide financial support to this ministry? Enjoy live music, dinner, and fellowship by attending “Concert 4 A Cause” on Saturday, April 27. Proceeds from this event go to CanCare Atlanta. For more details about the concert, see the separate article in Bridge at the Creek. To request support from a CanCare volunteer, to purchase tickets for “Concert 4 A Cause”, or for more information about this event or CanCare, please email Chet Burdick (chetburdick@bellsouth.net).